Platelet-Rich Plasma (PRP) injections are a great option for individuals wanting to improve the appearance of wrinkles, scars, sun damage, and dark circles under the eyes. 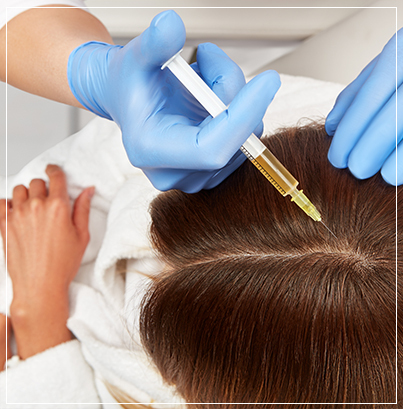 However, PRP injections are not just for the face; they can also be used to stimulate hair growth and rejuvenation. This type of therapy promotes healing and aims to restore damaged areas, whether on your face or head. How does it work? PRP therapy takes a patient’s own platelets and fibrin, injecting them into the area in question. This cosmetic treatment is ideal for individuals suffering from substantial wrinkles on the face associated with aging and hair loss. Here at Euro Image Med Spa, we believe in offering our patients a wide range of treatments aimed at addressing various cosmetic concerns. While we can’t stop aging, we can restore a more youthful appearance and support the skin through various safe injections and therapies. We are an aesthetic and laser center specializing in a wide range of anti-aging and rejuvenation treatments, including PRP injections. Our services are a great alternative to plastic surgery, allowing individuals to achieve their desired look without undergoing invasive operations. If beautiful skin is your goal, we encourage you to give Euro Image Med Spa a call today and schedule a free consultation. We understand that all of our patients have their own special concerns, which is why we offer customized programs for each and every client who walks through our doors. We offer PRP injections, PRP for hair restoration, and PRP therapy, which is a microneedling technique often referred to as a vampire facelift. An estimated 50 million men and 30 million women suffer from a pattern of baldness, which can be both frustrating and embarrassing. If you’ve tried all the over-the-counter hair growth products with dismal results, we suggest you consider PRP injections for hair rejuvenation. This innovative therapy helps regrow lost hair, without all the unpleasant side effects. This type of therapy works by reintroducing platelet plasma cells to help promote hair growth. The plasma is injected into the scalp at the sight of hair loss over a course of three months on a monthly basis. Please keep in mind that the injection schedule will depend on the pattern and amount of hair loss, age, hormones, and genetics. We encourage you to schedule a free consultation with one of our medical professionals to learn more about whether PRP therapy is right for you.